Southbank Centre drops Shell as sponsor! Campaigners are celebrating after the Southbank Centre announced that its sponsorship relationship with Royal Dutch Shell would be coming to an end in 2014. The artistic director, Jude Kelly, announced the new classical music season on Thursday 23rd January, with the ‘Shell Classic International’ concerts now replaced with an ‘International Orchestra Series’. The change comes after a period of heightened campaigning, with the Shell Out Sounds protest choir, open letters from concerned artists and performers, and comment from public figures appearing at the Southbank, all adding pressure. The Southbank Centre claim that Shell decided to end their sponsorship after eight years and seek new opportunities. However, the Southbank have known of Shell’s decision for only a few months and the Southbank has now been left without a new sponsor to take their place. Such an abrupt turnaround suggests that this was not a well-planned conclusion but the consequence of internal tensions and external pressure. The Southbank Centre need to make public the real motivations behind the end to this relationship in order to demonstrate that it is an institution which is now wholeheartedly committed to sustainability and social justice. Shell have been widely criticised for a range of environmental and human rights injustices: extensive spills and contributions to the military in Nigeria, extraction of tar sands oil on Indigenous people’s lands in Canada and attempts to drill in the Arctic. Their reputation threatened to tarnish that of the Southbank Centre by association. Over many years, groups including Platform, London Rising Tide and Shell Out Sounds have protested and raised awareness at the Southbank. Last October, the Shell Out Sounds choir gave an unsanctioned performance from the Royal Festival Hall’s choir seats before a Shell Classic concert could begin, following-up multiple choral ‘flashmobs’ in the Festival Hall foyer during concert intervals. In November, on the anniversary of the death of the Nigerian activist, Ken Saro-Wiwa, twenty-one artists who had previously performed at the Southbank, including actor Mark Rylance and composer Matthew Herbert, signed an open letter asking for Shell to be dropped. The author Margaret Atwood and environmentalist Jonathon Porritt have both also raised the sponsorship issue when they made appearances at the Southbank in 2013. 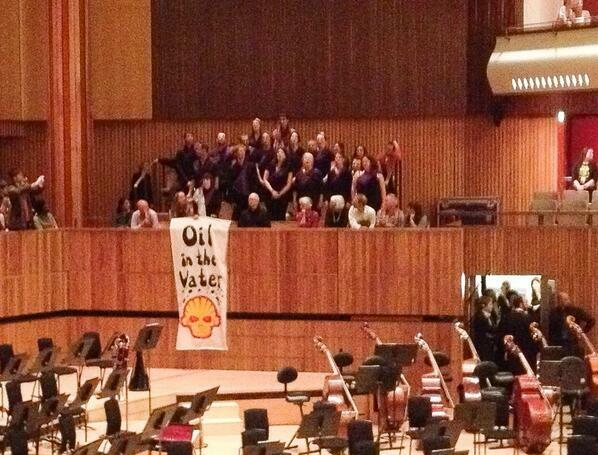 The successful campaign at the Southbank is part of a growing movement against oil sponsorship. Liberate Tate, a collective of performance artists, recently performed ‘parts per million’ at Tate Britain, where fifty veiled performers recited historical increases in carbon emissions as they moved through the BP-sponsored chronological galleries. Only last week, the Reclaim Shakespeare Company performed an adapted version of Macbeth in the gallery, where sinister BP executives tempt a fictional Tate director into a shady sponsorship deal. All these groups are part of the Art Not Oil coalition, a growing community demanding an end to cultural sponsorship by large oil companies. The Southbank’s decision now clears a path for other institutions, such as the Tate, the Royal Opera House and the Science Museum, to end their relationships with companies such as BP and Shell. The campaigns to end these relationships will press forward with renewed energy and innovative, creative strategies.